A solar fan can ventilate any area that accumulates a lot of heat such as an attic, shed, garage, greenhouse, boat or any other place you need ventilation. These fans operate off of the suns energy, collecting the suns light in a solar panel then converting it into electricity to be used to power the fan. 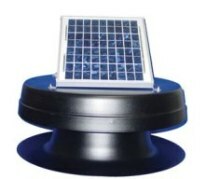 A solar power fan can be installed anywhere that the solar panel can get direct access to the sun. Then it will run off of the suns power, Free of charge. Many of these fans have separate solar panels that can be installed away from the location of the fan, so that you can get the best access to the sun. Have a look at the fans below to see which one will work best for you. This solar fan will save you a tremendous amount of money in the summer by eliminating the hot air in your attic. This will reduce the heat in your home making the air conditioner work less and cool better, saving you money. 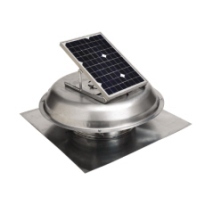 A solar gable vent will save you a lot of money in the summer by lowering the heat accumulation in your attic. It will also help to extend the life of your roof by eliminating the moisture builup in your attic. 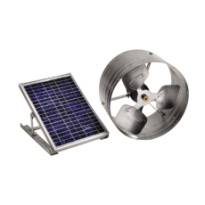 This solar fan can also be used wherever you need some additional ventillation, like you shed or greenhouse. Saving money on your power bills in the summer begins by getting your house as cool as possible even before you run the AC. The best way to do that is to remove as much of the hot air built up in your attic as possible. This way your air conditioner does not have to work as hard to cool your home, saving you quite alot of money on your power bill, not to mention the wear and tear on the AC. Return from solar fan to residential solar power. Return from fan to solar energy scene home.